The Honey Boo Boo family had to give Glitzy the pig back to the breeder, but they're trying their hand at domesticating another farm animal. 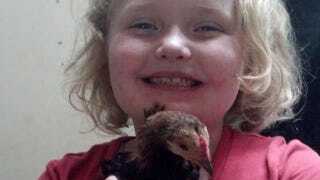 The new pet is Nugget, a chicken that lives in a cage inside the house, according to Mama June's posting on Facebook. Alana supposedly loves him, but if you watch the show, you also know that she loves eating chicken nuggets. PETA got wind of the family's new pet and what they named it, and promptly sent Alana a letter, telling her that "chickens are smart, interesting animals with personalities of their own." According to PETA, chickens can do simple math. They want Alana to tell her fans "they should be nice to chickens by not eating them," and then suggested that she get into eating vegan nuggets instead of real ones. Mama June declined to comment.